The Original Flexible Game Call maker has teamed up with Michael Waddell and the whole Bone Collector Brotherhood to create possibly the most innovative deer call to enter the woods. To put it bluntly, we put THE WHOLE HERD IN ONE CALL. 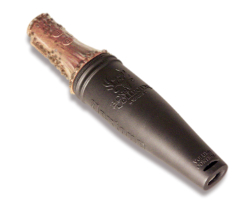 The Buck Collector produces all known vocalizations as well as wheeze sounds through one killer deer call. No matter what deer vocalization you need to produce, the Buck Collector will do it simply by squeezing the labeled buttons while you blow. You can instantly change from Fawn bleats or Distress Bawls to Doe Estrus Bleats to Buck Grunts and Aggressive Growls. The call even has an integrated snort wheeze that amplifies the sound as it travels through the exhaust chamber. Not only does this call do more than any other Deer Call on the planet, flextone technology- the soft flexible design, more accurately mimics the soft flexible tissue of an animal's neck, mouth, and tongue to produce the most natural sound ever produced in a deer call. If that was not enough to prove that this is the best deer call ever made, you will also appreciate silence of the soft flexible design if it accidentally contacts your gun or bow. Throw yourself a bone and put that buck of lifetime in the back of the truck with the Buck Collector!